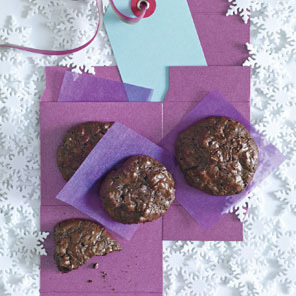 Whether you are baking for a cookie swap or yourself, these recipes are sure to please. For the exception of the first recipe, all cookie recipes are created to be lighter on calories and fat. Healthy cookies, yessss. Happy holidays! These everything-but-the-kitchen-sink cookies are my absolute favorite. Every time I make these, people go crazy. Toffee pieces can be found in the baking sections of grocery stores. Preheat oven to 350 degrees. Line two baking sheets with parchment paper; set aside. 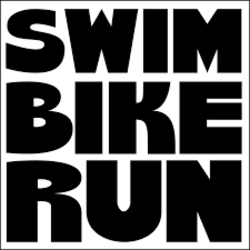 In a large bowl, sift together flour and baking soda. In the bowl of an electric mixer fitted with the paddle attachment, cream the butter and both sugars on medium speed until light and fluffy, 2 to 3 minutes, scraping down the sides of the bowl once or twice during mixing. Add the egg; mix on high speed to combine. Add the vanilla; mix to combine. Scrape down the sides of the bowl. Add flour mixture to egg mixture, and mix on low speed until well combined. 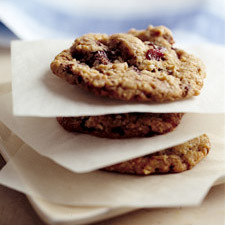 Add the oats, cherries, chocolate, and toffee pieces; mix to combine after each addition. 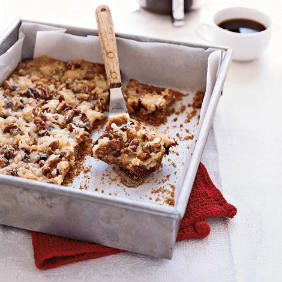 Spoon a heaping tablespoon of dough onto a lined baking sheet. Repeat, spacing 2 inches apart. Bake cookies until golden brown, 14 to 16 minutes, rotating baking sheet halfway through. Transfer to a wire rack to cool. Store in an airtight container up to 2 days. Position 2 racks in the upper and lower thirds of the oven. Heat oven to 350°. Line 2 large baking sheets with parchment paper. Place walnuts on a work surface and finely chop. Transfer to a separate large baking sheet and toast until fragrant, about 9 minutes. Let cool. Mix sugar, cocoa and salt in a bowl. Stir in walnuts. Add egg whites and vanilla; beat with a fork or an electric mixer on medium until batter is just moistened. (Do not overbeat batter or it will stiffen.) Drop batter by the teaspoonful onto baking sheets in evenly spaced mounds. Bake cookies until tops are lightly cracked and glossy, about 15 minutes. Repeat with remaining batter. Store in an airtight container at room temperature for up to 1 week. This chewy classic is dressed up for the holidays with a festive, to-die-for drizzle of chocolate. Oats replace part of the coconut to make this a lowfat yet still satisfying goody. Heat oven to 350°. Spray 3 baking sheets with cooking spray; set aside. Stir egg whites, coconut, oats, vanilla, sugar and salt in a bowl until well blended. Drop tablespoons of dough onto baking sheets, half an inch apart. 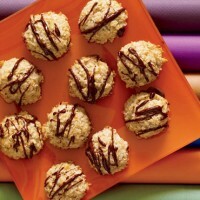 Bake macaroons until light golden, 12 to 15 minutes. Transfer to a wire rack and cool completely. Place chocolate morsels and margarine in a glass bowl or measuring cup. Microwave on high until chocolate melts completely, 40 to 50 seconds, or melt in a 350° oven 5 to 6 minutes. (Do not overheat chocolate or it will scorch.) 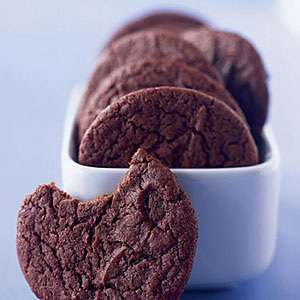 Dip a metal teaspoon into warmed chocolate and gently drizzle chocolate over cookies in a zigzag pattern. Cool completely. Store in an airtight container in a cool, dry place for up to 3 days. They can create a sticky mess in the pan, so it’s crucial to line it with parchment paper. Because the milk needs to seep into the graham cracker crumbs, don’t pack the crumbs too tightly in the bottom of the pan. Calories 123 (32% from fat); Fat 4.4g (sat 2.3g,mono 1.3g,poly 0.6g); Protein 2.1g; Carbohydrate19.1; Fiber 0.5g. Preheat oven to 350°. Lightly spoon flour into a dry measuring cup; level with a knife. Combine flour, soda, and salt; set aside. Melt butter in a large saucepan over medium heat. Remove from heat; stir in cocoa powder and sugars (mixture will resemble coarse sand). Add yogurt and vanilla, stirring to combine. Add flour mixture, stirring until moist. Drop by level tablespoons 2 inches apart onto baking sheets coated with cooking spray. Calories 78 (31% from fat); Fat 2.7g (sat 1.6g,mono 0.8g,poly 0.1g); Protein 1g; Carbohydrate: 13.4g; Fiber 0.5g. Previous PostGreen Tip: It’s cold, even your water heater needs a jacket!